When you are moving from Sydney to Newcastle, you need the best removalists around. You need a removalist company that thoroughly understands all the ins and outs of furniture removals and able to handle the move professionally, so you feel like it’s a smooth local move. You also need removalists that treat you as a valued customer and give your possessions the ultimate care during your move. You need Next Level Removals. From the moment you contact our impressive furniture removalist team to the time you wave goodbye to removalist truck driver, you’ll experience a fantastic level of service. We go the extra mile for you to make sure that you are delighted. Every one of our friendly and professional Newcastle removalists team is highly trained, with at least five years of removalist experience. This means that we can assure you the best Sydney to Newcastle movers service available. Our customers love the Furniture Calculator on our website. No more guesswork or measuring furniture to estimate its volume. Merely tick boxes online and out comes the volume, all calculated for you. 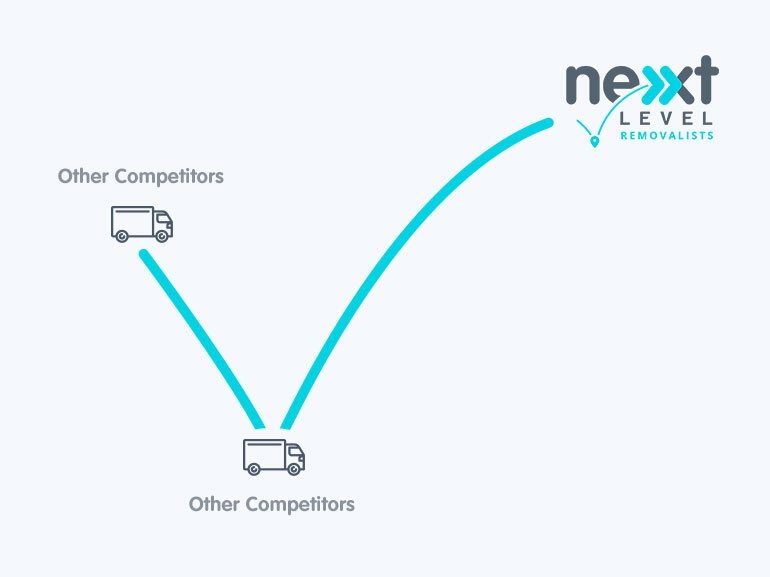 We advise you to call our super-friendly team on 1300 005 400 or email us at info@nextlevelremovals.com.au to confirm the volume so we can match it to the right-sized truck for your Newcastle to Sydney move. Packing for any move is a chore for most people. Why not let our Next Level Removal team pack for you? We’re experts at making the best use of space, and we also make sure that every single item we pack is entirely protected. So for stress-free packing for your Sydney to Newcastle relocation, call the experts at Next Level Removals. Our Sydney Newcastle removalist rates are very competitive. If you want anything at all clarified or explained, just call our friendly call centre operators on 1300 005 400. Or email us at info@nextlevelremovals.com.au. Our furniture removalist team will be at your door at the arranged time and will treat your belongings with the utmost care. Our years of experience mean that we know how to pack our trucks to ensure that all your furniture is safe for the trip. Instead of randomly picking things in boxes, it’s advisable to organise everything. This will make it easier to unpack everything when you arrive at your new home. It will also let you find something fast you may need before you leave. Pack items in boxes together from the same home, and label the boxes. This makes it easy to know where to put them in your new home. Be sure to place the heaviest items at the bottom of each box, and also that each box is secure so that items can freely move around. Using bubble wrap or newspaper is excellent for this. Also, ensure that each box is sealed correctly. Our Sydney to Newcastle removals will gladly help you with any removal aspect, in addition to making the moving to make the day less stressful. We carry your belongings, put them in our trucks and transport your furniture to your new place. When we unpack at your new home, we know that it’s essential to place your furniture where you want it. Our careful movers put your beds together, connect your washing machine and switch on the fridge. In short, we do whatever we can to make it simple for you to settle in. If you’ve arranged for us to unpack for you, our team will be ready to start as soon as we start unloading. Our Sydney to Newcastle furniture removalist rates are very competitive. If you want anything at all clarified or explained or you want to know how much does it cost to move from Sydney to Newcastle, Call our friendly call centre operators on 1300 005 400. Or email us at info@nextlevelremovals.com.au. When it comes to backloading removals, Next Level Removals is the best backloading company! When it comes to furniture removal from Newcastle to Sydney, Next Level Removals offers you unbeatable door-to-door service – at the best rates in the business. When you want the best team, the best removalists for your move and the best price – call Next Level Removals. We take moving to the next level!